Scamwatch is urging tech-savvy daters to be on the lookout for romance scammers this Valentine’s Day as data shows these scams are increasingly happening through social media and dating apps. “Scammers tend to go where people are, and in the dating world that increasingly means on social media and dating apps,” ACCC Deputy Chair Delia Rickard said. Women are particularly at risk to losing money to romance scams with Scamwatch data showing they are four times more likely to report losing money compared to men. 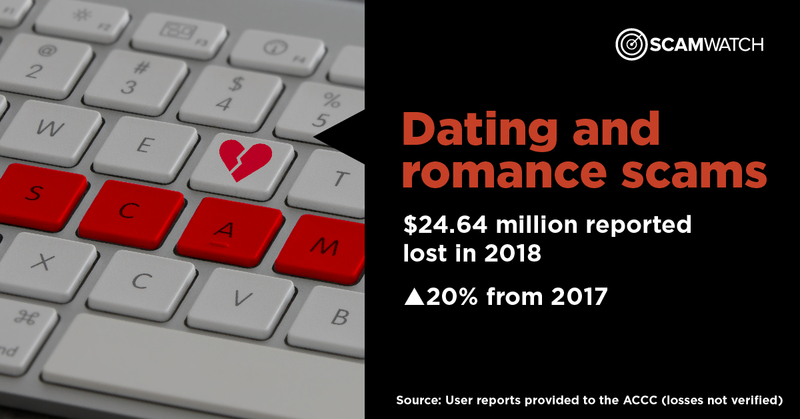 Scamwatch received nearly 4000 reports of dating and romance scams last year, with losses of over $24.6 million – a 20 per cent increase from 2017. Women reported a total financial loss of almost $20 million while men reported a total loss of almost $5 million. People aged 45 to 64 were the most affected. Social media is the most common contact method used by scammers to engage their victims. However Scamwatch is seeing increasing reports of romance scammers using mobile apps like Tinder, Facebook Messenger and Viber. Losses reported where the scammer and victim met on an app have increased more than 300 per cent in the past two years. Romance scammers begin by establishing trust to form a relationship, then start making up stories about needing money to help cover costs associated with illness, injury, business expenses, duty or customs fees, legal costs, family costs, and travel. The scam can continue for years and Scamwatch receives many heart breaking stories about the financial and emotional toll they take. “Finding potential new love is exhilarating but that can make it easy to miss the red flags that point to you falling for a scammer,” Ms Rickard said. “On apps, it can be trickier as the whole point is meeting new people. However, nearly all romance scammers will eventually reveal their intentions, which is getting your money. If you’ve only ever known the person online or through an app, don’t give them money. You may think you love them and want to help, but they’ll just break your heart, and deplete your bank account,” Ms Rickard said. For more advice on how to avoid dating and romance scams, visit Scamwatch. People can also follow @scamwatch_gov on Twitter and subscribe to Scamwatch radar alerts.